Sustainability is the big buzzword these days as more and more people become environmentally conscious. But how does this apply to renovating your home and the types of materials you should consider using? Let’s take a close look at what to consider when renovating your kitchen and the materials you could choose to be more environmentally friendly. When designing a new kitchen, consider reusing anything you already have onsite. That not only saves money, it reduces landfill. 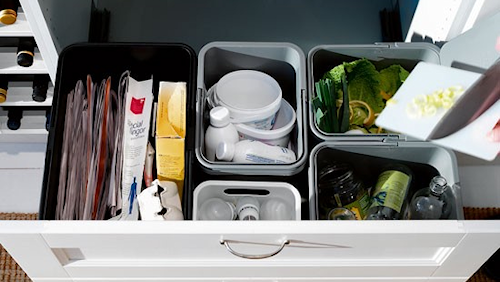 If you include easy-to-use recycling stations and a place to collect food scraps for the compost, this will help make the kitchen more efficient and easy-to-use, while minimising the environmental impact. If you are installing new kitchen cabinets, keep an eye out for cabinetry that has low or no Volatile Organic Compounds (VOCs). VOCs are known to cause long-term health issues, particularly if a member of the family has asthma or another respiratory condition. There are many options available these days. Look for ‘E0’ boards – they’re available in most places at the same price as others. Find cabinets that are of a good quality, locally sourced, and/or made from recycled materials. If you are renovating an older kitchen, recycle any part of that kitchen you can. Retaining the carcass of the kitchen and choosing to replace the cabinet doors and bench top instead could “lift” the whole look of the kitchen and save you a lot of money. For bench tops and splash backs, you want to ensure you select a durable, non-porous, firm surface that is stain and scratch-proof. Rather than using glues and adhesives to glue the bench tops and splash backs to the cabinetry and wall, use screws where possible. There are areas where glues and adhesives are needed. Opt for a low VOC adhesive wherever possible. The good thing about mechanical fixing (using screws to fix a bench top) is that it allows for secure joining and easy removal in future. Some good bench top options to look out for are sustainably sourced or recycled wood or bamboo models, Paperock, recycled stone (e.g. Cosintino’s eco range), tiles, and even concrete. There are several new glass and plastic products coming onto the market which are worth some investigation, but be careful to look into the make-up of these carefully. It’s also worth mentioning reconstituted stone bench tops. Some of these are made from small pieces of stone and adhesives which have VOCs in them, so do your homework and ask the question – what is the VOC content of this product and how durable is it? 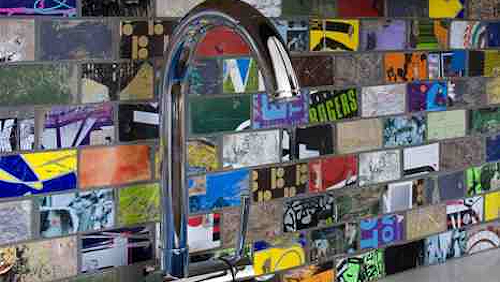 A sustainable kitchen should have taps that have a Water Efficiency Level Standard (WELS) of at least 3 stars. Buy a quality tap for these fixtures, as the better quality your taps are, the more longevity you can expect from them. If you don’t want to purchase all new fixtures, consider looking into flow restrictors as an alternative. These increase the water efficiency of the tap, cost just a few dollars and are easy to install yourself. Then it comes to flooring, your kitchen will need strong, durable surfaces that will last the test of time. Choose a type of flooring that can be installed with non-toxic sealants and glues. Consider using recycled materials such as rubber, cork and tiles. If you are after floorboards, look for Forest Stewardship Council (FSC) certified timber or bamboo. When building or renovating your kitchen, lay the flooring underneath the cupboards so that in future, if you wish to remodel, you won’t need to redo the floors. There are some great non-toxic finishing products hitting the Australian market at the moment. Of particular note is the growing range of natural oils and paints used for walls, cabinetry and bench tops. There are some brands you might want to look at. Livos, Mythic Paints and Resene have a great range, but you aren’t likely to find them in your local hardware stores just yet – so click the links to find out where you can access them. For some more information on sustainable kitchen materials, head to Eco Specifier (Global Green Tag) or Good Environmental Choice Award (GECA), for a list of independently certified products.